Prague is, without a doubt, one of my favorite European cities, thanks to its incredible blend of architectural styles, its sweeping views and intriguing history. As a child, I grew up hearing tales of life in 1930s Prague from our dear family friend, Erna, who was also my first piano teacher. Erna’s fascinating tales from her homeland made the so-called Golden City come to life. This image was captured on a late spring trip in 2009. Though I wish I had been quicker on the snap, so that I could’ve captured the man’s full silhouette, I loved how the sun illuminated building #10 on this quiet, cobbled lane. 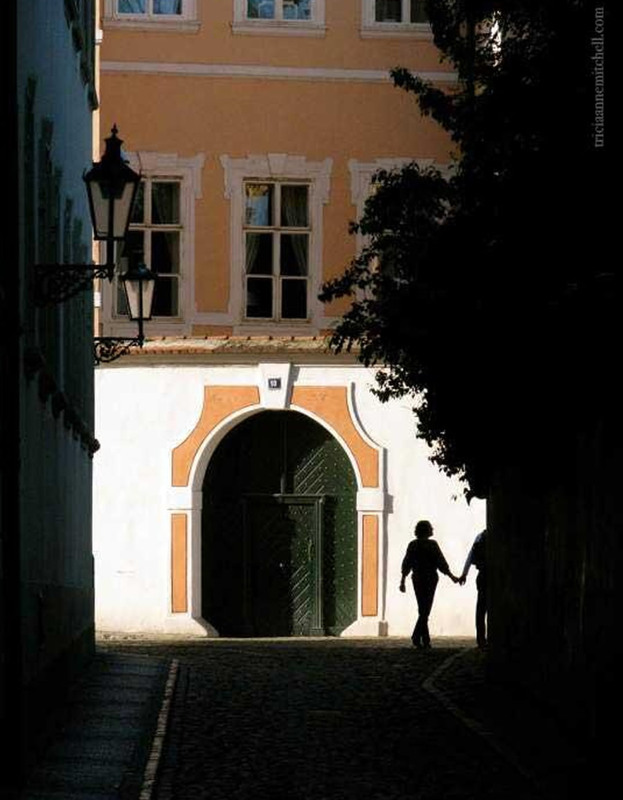 I am with you – Prague is stunning! Great photo! No I think you got it just right, I might have gone with less of the man, maybe just an arm, taking her around the corner to……………where? I like that, Mark… An air of mystery! Where are your travels taking you to next? Hi Tricia, I’m off to Amsterdam on Monday, hopefully get some time to click away. Belated bon voyage wishes to you, Mark! That peachy colour is so nice. Like icecream. A tasty simile, Jo – love it! Many thanks! Prague is quite a photogenic city and the lighting was special at this moment. Thank you very much, Richtush! It is a pleasure to connect and soak up some of your photography pointers. Thanks for sharing your myriad experiences..and beautiful pics and stories. Do look at the rules! Congratulations ! Thank you so much, Virginia! We just successfully renewed our passports, so hopefully a visit to Canada will be in order. :) Hope your week is off to a super start! This is lovely. I think it’s better for not having the other figure. It makes one wonder and I love an image that suggests a story. Karolyne, thanks for sharing the fun tale from Prague — it is indeed a magical city. And, I’m pleased to say that I was finally able to go there with my special someone.